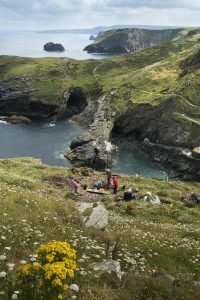 Tintagel has seen a lot happen over the last two years, a planned excavation has revealed some exciting archaeological discoveries and developments to make the historical sites more accessible has been met with controversy. 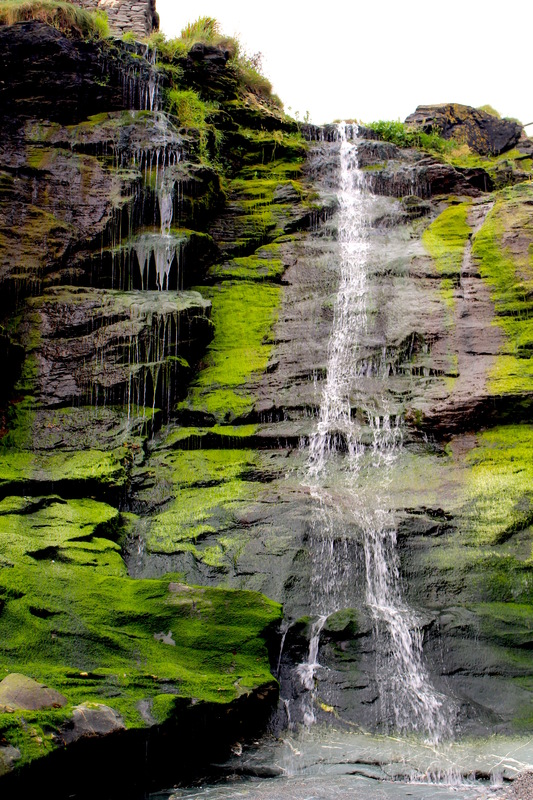 Over the summer, myCornwall visited this unique heritage location to uncover the truth behind the mysteries. 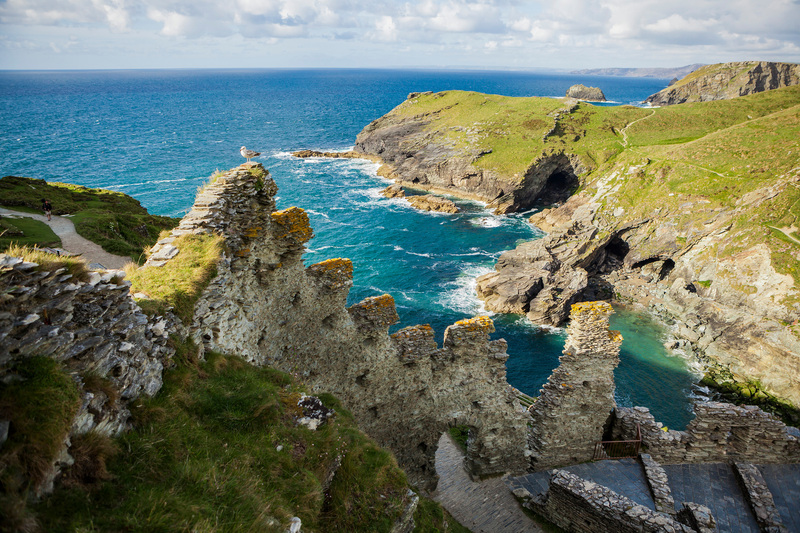 The unmistakable ancient aura of Tintagel has drawn visitors to its medieval ruins for centuries. A place of myth, mystery and legend, Tintagel has embraced its English folklore and charm with open arms. 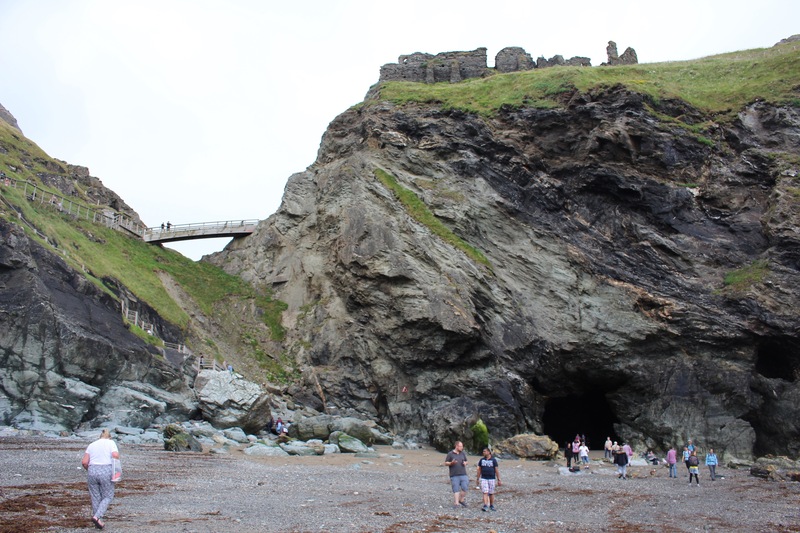 The archaeological findings and picturesque beach have proved it to be a popular hit with tourists from around the world, but when it comes to debunking the myths and digging under the surface of this historical place, what is Tintagel really all about? Over the past year, Tintagel Castle has been thrust into the spotlight. With an exciting archaeological dig, part of a five-year research project, finally kicking off, to the controversial announcement of a new bridge being erected on the site, Tintagel Castle has been hitting the headlines for more than just its magical mysteries. 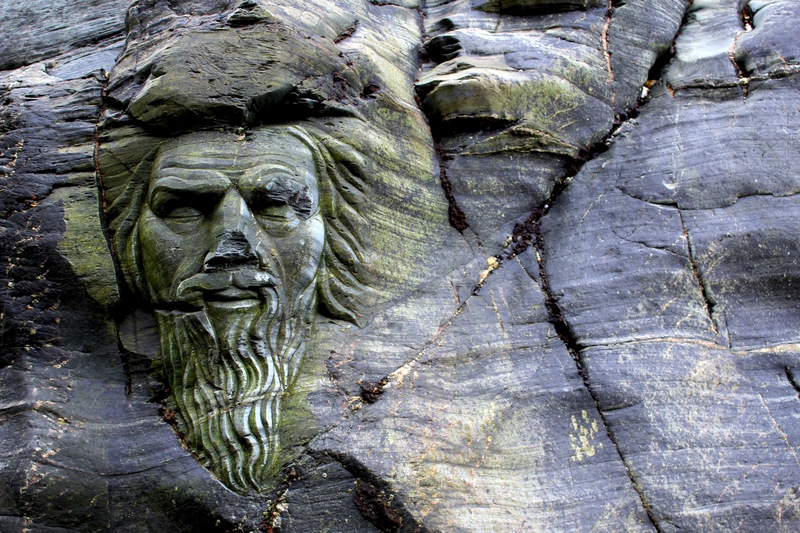 Tintagel’s legacy as a historical landmark goes far deeper than anyone could have expected. The 2016 excavations revealed an abundance of information, including the area’s Mediterranean roots. Pieces of fine plates, bowls and fragments of decorated glass vessels show that people living in Tintagel some twelve-hundred years ago were trading with the Mediterranean world. Early Cornish kings feasted on oysters, roast pork, fine wine and even cod from the deep sea. This ‘First Golden Age’ proves that Tintagel was almost certainly a royal site, using its advantage of being on the coast of the Celtic Sea. 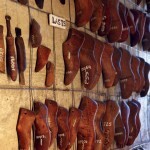 “Over the decades, excavations have revealed thousands of pieces of early medieval Mediterranean pottery at Tintagel Castle, giving us clues about the site’s past,” explains Head of Operations in Cornwall, Georgia Butters, “Whilst we don’t know exactly what was happening on this site, these finds do point to it as a thriving trading centre of high status. “Items like amphorae from the Mediterranean, fragments of fine glass, and bowls from Turkey must have arrived here somehow, probably the results of systematic trade routes. The buildings on the island, some of which have hearths, also suggest intensive occupation at this period. It’s baffling to image that perched on a clifftop along a rugged Cornish coast, at a time where the end of the Roman Empire saw Britain doubtful of its future, that such advances in fishing, trade and survival existed. The discoveries in Tintagel opened up a doorway into the past that had been closed for decades with no real ground breaking conclusions. Now, with the promise of even more to be uncovered on the horizon, a much larger area on the southern terrace is set to be excavated to explore a range of stone walls and buildings found at the dig site. 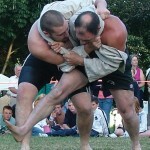 Photograph by Emily Whitfield-Wicks. Tintagel Castle Archeology dig. Geographical shifts in the earth have had a serious impact on the castle grounds for the last millennium and Georgia goes on to explain that the remains we see and explore today are quite different from what people of the time settled around. It’s a stark cry from the mythical Arthurian folklore that has given Tintagel its identity and has drawn in visitors for hundreds of years. The castle itself, built by Richard the Earl of Cornwall during the 13th Century, dates back to earlier medieval settlements, so how much of the legends are actually true? 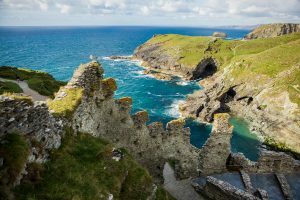 The initial interest, nearly eight hundred years ago, saw the myths and legends about Tintagel’s ancient English heritage thrust into a fantastical status. With a revived interest during the Victorian period, with writers, artists and tourists inspired by the magical aspects of Tintagel saw the town adhere to its magical reputations. “Today, it is impossible to understand the history of Tintagel without understanding how the legends have shaped it,” Georgia adds. 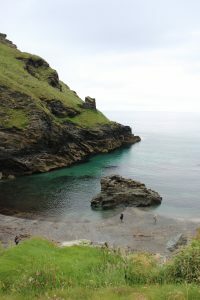 Of course, the site and towns Arthurian themes are what draws a lot of attention to Tintagel. Last year the sites curators, English Heritage, received mixed reviews when they unveiled a carving of Merlin’s face into the cliff near the legendary wizard’s supposed cave. This was soon accompanied with a statue representing King Arthur helicoptered onto one of the site’s most prominent spots. Now, with plans to make the castle site more accessible to visitors, a new bridge to connect the ‘islands’ is underway for permission and has once again seen Tintagel under the spotlight of criticisers, many of whom believe the bridge will tarnish the natural beauty, as well as the conservation, of the site. 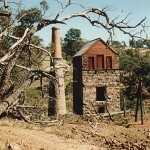 “Conservation of the historic site is our top priority,” Georgia explains, “and the project includes a larger programme of landscape works. These would improve the footpaths around the site and to help limit the impact of visitors on Tintagel Castle’s unique archaeology and ecology. 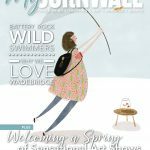 And as Cornwall continues to grow as one of the UK’s top holiday destinations both for national and international travellers, the increasing tourism boom will be pushing many Cornish hotspots to accommodate the extra visitors and longer seasons. 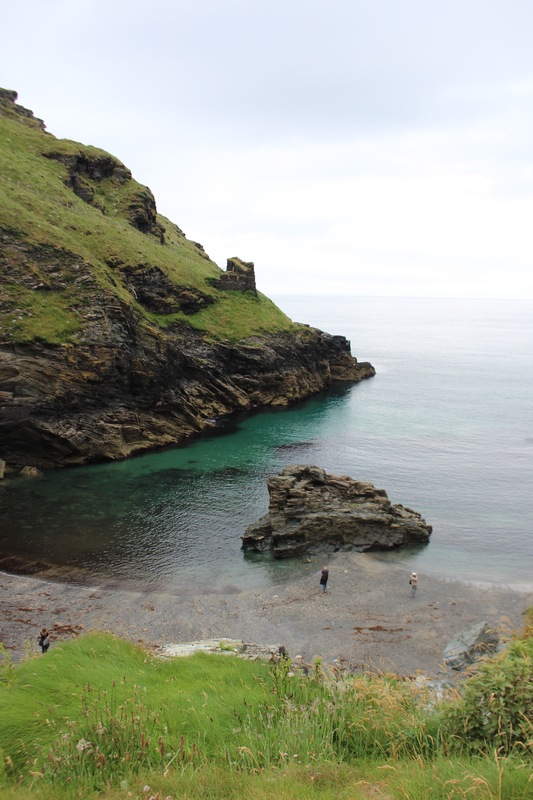 So, whilst the bridge, and other more creative ideas for the site, may have been met with differing opinions from the public, it can’t be denied the thrill and allure of Tintagel as both a magical and historical destination won’t be dissipating anytime soon.